As we age our skin looses elasticity and begins to droop. This is a common occurrence around the eyelids where the skin tends to stretch and the muscles surrounding the eye weaken over time. Excess fat is also likely to accumulate around the area causing eyebrows to sag. This can cause someone to look older than they actually are, in addition to making a person appear to be frowning when their face is at rest. Although this can be a natural part of the aging process, a drooping eye can greatly affect one’s appearance, or even one’s vision. Fortunately there are several cosmetic options for lifting sagging eyes that allow you to regain your youthful, fresh look. It is increasingly common for people looking to improve their appearance to search for non-surgical cosmetic solutions. Besides the fact that non-invasive techniques tend to be less expensive, people are also looking to plastic surgery alternatives because they offer quick results, non-permanent changes and much less downtime. Although eyelift surgeries are commonly performed, the “non-surgical eyebrow lift” with Botox is an increasingly popular solution for sagging eyelids and eyebrows. 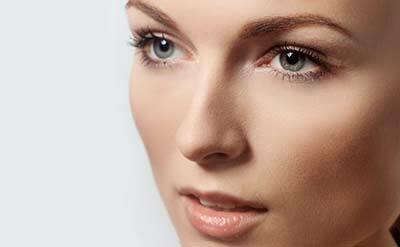 Botox can be a highly effective treatment for eyes that appear to be pulled down, or drooping. The injection is carefully placed along the brow area, in the vertical portion of the facial muscle that closes the eyelids. This relaxes the corrugator, procerus and orbicularis oculi muscles that pull the eye downward. By relaxing these muscles, the eyebrow is actually elevated between 2-3mm in the majority of patients. In some patients the medial brow is slightly elevated as well. The major benefit of this procedure is that it’s an effective, quick treatment with no downtime that allows most patients to return to work and their regular daily activity immediately. This is an advantage for many patients who do not want the downtime often associated with surgical procedures. Results typically last from 3-6 months, wherein the patient has the option to continue with further treatments. Although Botox can be a quick and easy procedure, in some cases a blepharoplasty, a minimally invasive surgical eyelift, is the best solution for lifting the skin around the eyelids and eyebrows. While Botox can be effective, it only lifts the brow by a few millimeters whereas a surgical treatment can lift the brow area approximately 1 centimeter or even more. Patients that have excess skin might not achieve optimum results simply with Botox. Instead, a surgical eyelift can provide results that are more substantial and permanent. Whether you are choosing to have Botox or a surgical procedure, or even just a consult, it is paramount that you consult with a highly experienced surgeon. Dr. Larry Milgrim, who is based in the New Jersey area, is a double board certified facial plastic surgeon with a patient-oriented approach. Dr. Milgrim’s exceptional training and experience allows him to prioritize patient satisfaction as well as patient safety. In addition, his procedures are individually tailored to each patient, ensuring long-lasting stunning results. Contact his office to evaluate which procedure can make your eyes larger and more youthful.